Do you have braces, or have you gotten them in the past? Or, maybe you’re considering Invisalign? 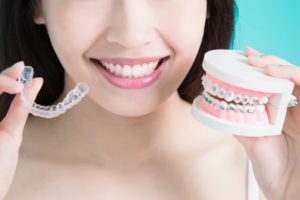 These orthodontic treatments are used every day to straighten smiles, but they have an interesting history that not many people know about. Keep reading to learn some interesting and surprising facts about orthodontics from an expert orthodontist in Columbus. Part of the magic of the way that orthodontists can shift your teeth is due to a process called “bone remodeling.” Cells called osteoclasts break down bone, while osteoblasts rebuild it. Eating a healthy and balanced diet help keep this process functioning properly. Your orthodontist uses pressure to shift your teeth into alignment, but sometimes pressure can be a bad thing. Habits like thumb-sucking can cause your teeth to get pushed out of place and even distort your bone. “Ortho” means correct or straight and “don’t” means tooth. If you put them together, you’ll understand why the act of straightening teeth is called orthodontics. In 1900, Edward H. Angle founded the first practice that was limited to orthodontics. He even started the American Association of Orthodontists, which has many members today. Archeologists have found mummified Egyptians with metal bands wrapped around their teeth. Additionally, a Greek doctor named Hippocrates wrote about irregularities of the teeth in 400 BCE. That means teeth have been crooked long before there was a tried and true way of fixing them. Gold used to be the most popular metal to use for orthodontics because it is malleable. This makes it easy to use for orthodontic appliances and braces. The only problem was that the metal was so malleable that it led to many adjustments during treatment. Orthodontic treatment is just that, a treatment. It’s not a product or commodity that should be purchased online, but it’s a tool that experts use to straighten smiles. Tools are great to have, but in the hands of someone that doesn’t know how to use them, they’re useless. Now that you know more about the history of orthodontics, do you think that you may need braces or Invisalign? Contact your orthodontist in Columbus to get started on a straighter and more beautiful smile. Dr. Amin Mason is a board certified orthodontist with additional training and skills to provide high quality orthodontics. He offers a wide range of procedures to straighten your teeth, so you can receive the best treatment for you. He currently practices at Polaris Orthodontic Center, and he can be contacted through his website or by phone at (614) 781-6990 for any questions.